Sets of mine surveying instruments first survive from the 16th century and often include a range of parts and accessories. This example has an original wooden box whose carved compartments show that a number of components have disappeared. 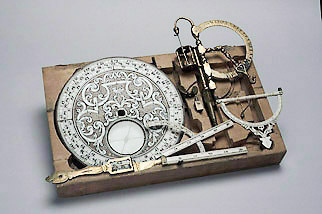 The surviving items include a decorated compass, a brass index arm, an ivory hanging clinometer, an ivory folding square and a brass combination line-clinometer and plumb level.